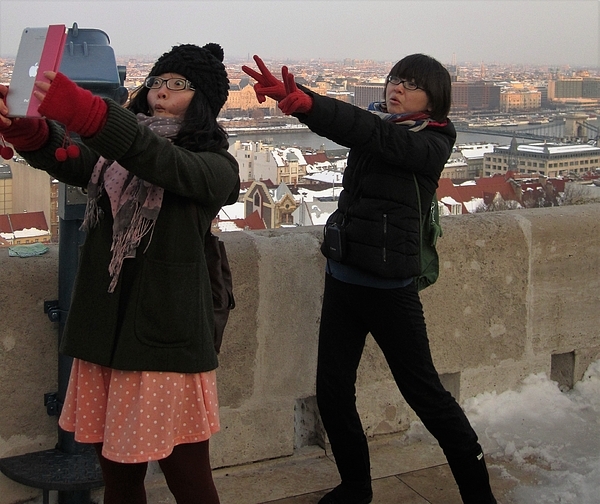 Technology has changed the way we do things as young tourists to Europe's capital cities no longer admire the sights but flip out an iPad to frame a quick selfie of themselves and share it online almost instantly; most likely with GPS information automatically geotagged to the image. Available as a framed print, this unique travel photograph was used on our 2017 Travel Photography Calendar. These two girls were enjoying themselves up on Budapest's Fisherman's Bastian, but I doubt the Danube made it into the frame. ✈ TravelNotes.org - The Online Guide to Travel.